The town of Fethard is one of the most precious pieces of the remaining medieval heritage of Ireland. More than one kilometre of town wall including three gates are left, as well as some town houses dating to the 15th century, a medieval church, and three Sheela Na Gigs. 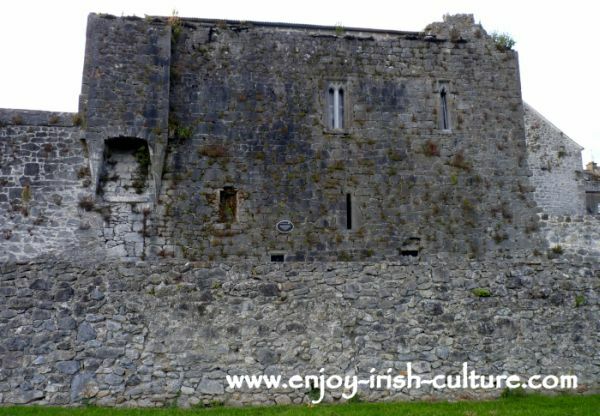 On this page I will introduce you to the eventful history of the town of Fethard which started as a planned Norman settlement in and around 1208. Fethard was established by the Anglo-Norman lord William De Braose, 7th Baron of Abergavenny (Wales) around 1208. Fethard was designed as a market town generating tax revenue for the English kings. Another purpose of planned colonial settlements was greater security for the crown. Because strength lies in numbers, colonists and settlers from Wales and England were invited in by giving legal and financial privileges. Many settlers may have come from De Braose’s estates in Wales. He promoted the settlement heavily and it is likely that his initiative contributed much to the towns’ later success. 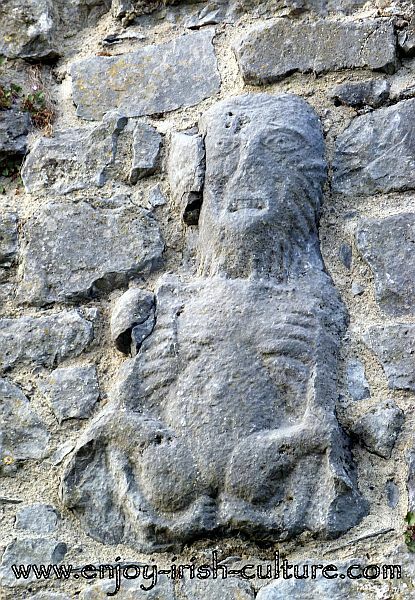 Heritage Ireland at Fethard, County Tipperary-Sheela na Gig in the town wall. 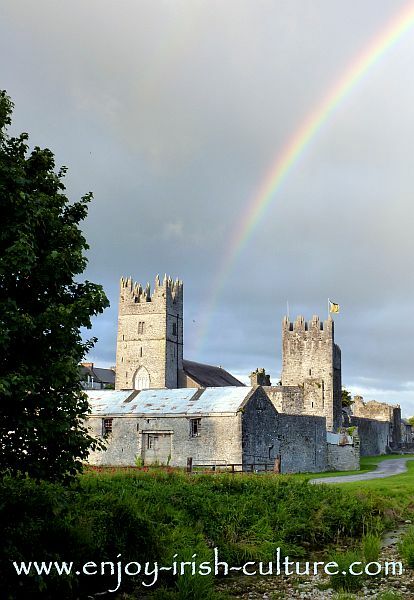 After a falling out with King John, Fethard was handed over by the King to the archbishop of Cashel in 1215 (Rock of Cashel) who now profited from the rents and taxes paid by the burgesses of the town. This arrangement lastet until the 16th century. 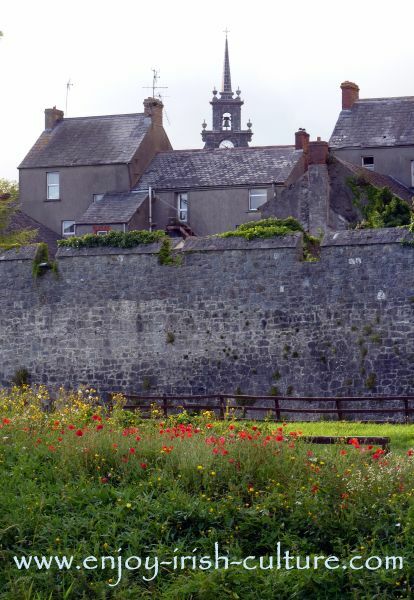 It was during this period that the town wall and town houses were constructed with license and grant aid from the crown, making Fethard such an important part of the heritage of Ireland. In 1328, King Edward III of England granted to James Butler, 1st Earl of Ormond, the right to administer Tipperary outside Royal jurisdiction as a ‘county palatine’. 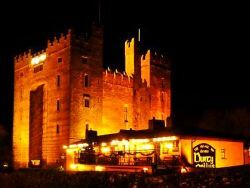 In 1433, James Butler, 4th Earl, also called the ‘White Earl’ published statutes at Fethard establishing Tipperary and Kilkenny as ‘one country under one government or lordship’. The Ormond liberty continued for some 400 years and was the last of its’ kind to be abolished in 1715. The Earls of Ormond attended courts held at Fethard, which shows the important status of the town in medieval times. Heritage Ireland- Holy Trinity medieval church and tower house castle at Fethard. Learn how to build a medieval castle, how to attack and defend one, enjoy the medieval castle lifestyle (Phew!) and learn castle vocabulary. Through ‘charters’ the town was granted special status by the king, allowing the towns people to look after their own legal affairs without involvement by the crown. The first charter was granted in 1552, followed by a second in 1608. The town paid an annual fee to the king in exchange for these liberties. The effect of this arrangement for the town was an economic boom that drew new merchants and other settlers from abroad. The Everard family of Fethard who swore allegiance to the Crown, were key figures in striking the 1608 charter deal for the town. Their town house is one of a handful of surviving medieval buildings. In 1650, Cromwell marched on Fethard. His armies had caused havoc and killed thousands of innocent civilians around Ireland already, not least in the neighbouring town of Cashel. News of the artrocity at Cashel had reached Fethard, and the town decided to surrender. From our viewpoint today, this meant that the structures of the town, the walls, church, tower houses and town houses, survived unharmed. 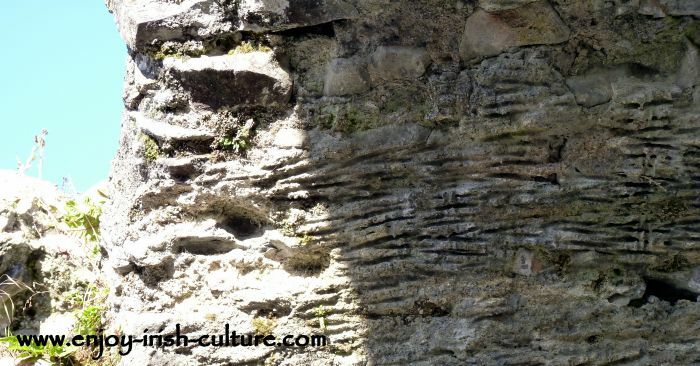 Heritage Ireland- Traces of medieval wicker work left in the plaster of the town wall give away the construction process used for vaults by the Normans. Today, despite featuring some of the most important medieval heritage in Ireland, Fethard is a quiet little country town. The town is known for its links with the horse racing industry. JP McManus owns a well-known horse stables here, and horse racing celebrities are known to socialise at the towns’ hotels. Apart from racing, there are very few employment opportunities in the area. Many residents are communting for work, for example to Clonmel or Kilkenny. The nearest cinema is at Clonmel, so for young people there is very little to do here. Unfortunately many leave the area once they finish school and move to more urban places like Kilkenny or Dublin. Taking into account the impressive medieval heritage site the town is, it is truly surprising that the town is not cashing in on tourism. We saw so much potential on our visit there! 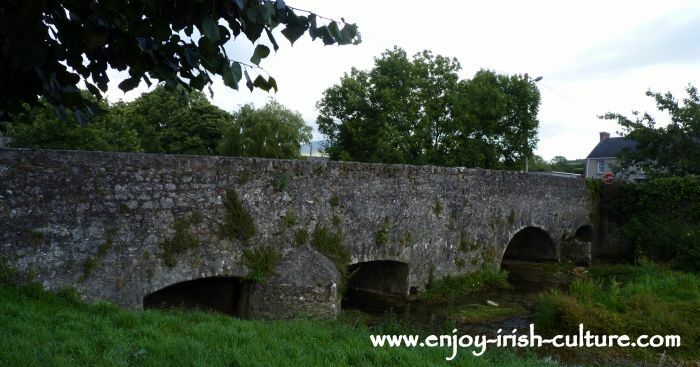 If you liked our page on the medieval heritage of Ireland at Fethard, please keep in touch. Use the social sharing buttons at the top left, leave a Facebook comment underneath, or go to our Facebook page (EnjoyIrishCulture) and click like.